This is a revised version of a “From the Local History Room” column that first appeared in February 2012 before the launch of this weblog, republished here as a part of our Illinois Bicentennial Series on early Illinois history. On Friday, Aug. 3, at 11 a.m., in the Pekin Public Library Community Room, the library will have a showing of two videos about Pekin’s first astronaut Lt. Commander (ret.) Scott Altman. The videos are a part of the library’s Illinois Bicentennial Series. First will be a 35-minute video of Altman’s keynote address at an April 1996 meeting of the Pekin Area Chamber of Commerce. Afterwards will be a showing of the footage of Altman’s recent induction into the National Aeronautics and Space Administration’s Astronauts’ Hall of Fame, a video 20 minutes in length. While the Bicentennial Series videos next week exemplify the astounding technological progress of the modern age, this week’s “From the Local History Room” column looks back to an important aspect of the push for moral and cultural progress in Illinois. This will we will take a trip back to the days of the slavery abolition movement, which made its mark in Pekin and Tazewell County, as it did in many other communities in the Northern States. The “Pekin Centenary 1849-1949” volume presents an enlightening narrative of that important time in our local history. It was largely due to the influx of German immigrants into Pekin, many of whom had fled religious persecution in their home countries, that abolitionist sentiment began to flourish in our city. Many Baptists were abolitionists, and in 1853 a German congregation of Baptists organized in Pekin – the origin of Pekin’s Calvary Baptist Church. 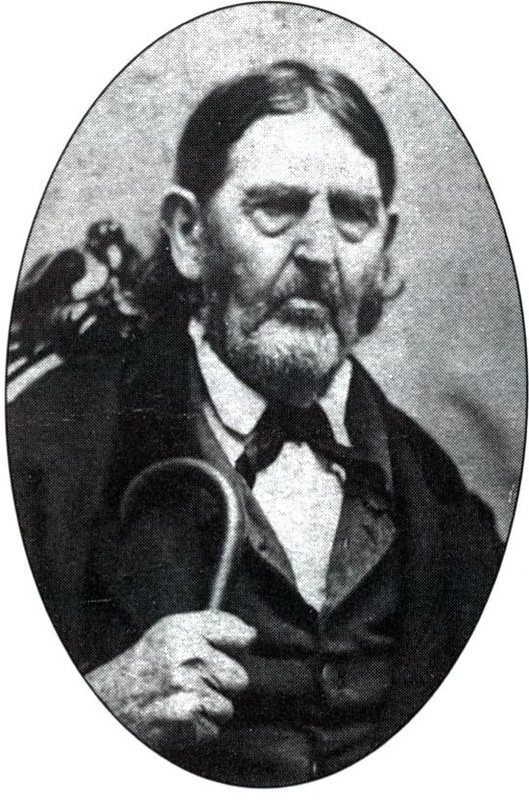 Among Pekin’s abolitionist leaders, according to the Pekin Centenary, was Dr. Daniel Cheever, who engaged in Underground Railroad activities from his home at the corner of Capitol and Court streets (and whose farm near Delavan was a depot on the Underground Railroad), by which runaway slaves were helped to escape to Canada. Other early Pekin settlers active in the abolitionist movement were the brothers Samuel and Hugh Woodrow (Catherine Street was named for Samuel’s wife, and Amanda Street was named for Hugh’s). The Woodrows aided runaway slaves at their homes in the vanished village of Circleville south of Pekin. 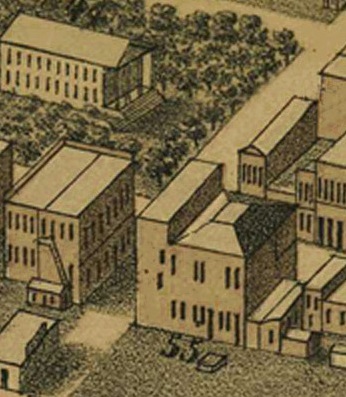 This detail from an 1877 “aerial view” map of Pekin shows the building, marked by the number 55, where the Union League was organized on June 25, 1862. 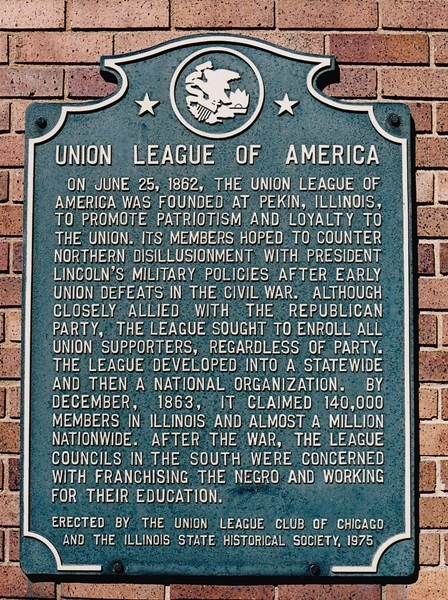 To counter the dominance of the Knights and promote the cause of the Union, a secret meeting was held on June 25, 1862, above Dr. Cheever’s office at 331 Court St., where 11 of Pekin’s early settlers formed the Union League to promote the cause of Union and abolition. 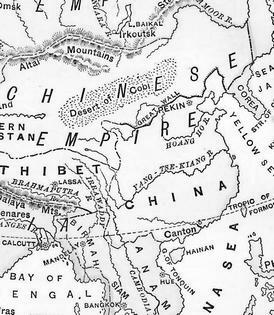 The anti-slavery Germans of Pekin quickly became active in the League. Soon a chapter of the Union League was organized in Bloomington, and then an important chapter in Chicago, where John Medill, founding publisher of the Chicago Tribune, was a leading member. Very soon the Union League had “swept the entire North and became a great and powerful instrument for propaganda and finance in support of the War” (Pekin Centenary, p.21). After the war, the League became a Republican Party social club, but would carry on its abolitionist legacy through support of civil rights for African Americans. The 11 founding members of the Union League were the Rev. James W. N. Vernon, Methodist minister at Pekin; Richard Northcroft Cullom, former Illinois state senator; Dr. Daniel A. Cheever, abolitionist and Underground Railroad conductor; Charles Turner, Tazewell County state’s attorney; Henry Pratt, Delavan Township supervisor; Alexander Small, Deer Creek Township supervisor; George H. Harlow, Tazewell County circuit clerk; Jonathan Merriam, stock farmer who became a colonel in the Union army; Hart Montgomery, Pekin postmaster; John W. Glassgow, justice of the peace; and Levi F. Garrett, Pekin grocery store owner and baker. The building where these 11 men gathered in June 1862 was later the location of the Smith Bank and Perlman Furniture in downtown Pekin. Perlman Furniture burned down in 1968 and a few years later Pekin National Bank was built on the site. Plaques commemorating the Union League’s founding are displayed inside and on the outside of the bank building. The founding of Pekin was due to the influx of settlers of central Illinois during the 1820s, in the decade following Illinois statehood. This area’s newcomers in that wave of settlement were first attracted to Fort Clark (Peoria), but before long pioneers were establishing homesteads up and down the Illinois River valley in Peoria’ vicinity. Pekin, as it well known, began with Jonathan Tharp’s homestead of 1824 on a ridge above the Illinois River, at what is now the foot of Broadway near downtown Pekin. Within a year, Tharp had been joined by several other settlers, including his own father Jacob Tharp (1773-1871) and brother Northcott Tharp, and his friend Jesse Eggman, all of whom arrived in 1825 and built cabins near Jonathan’s. 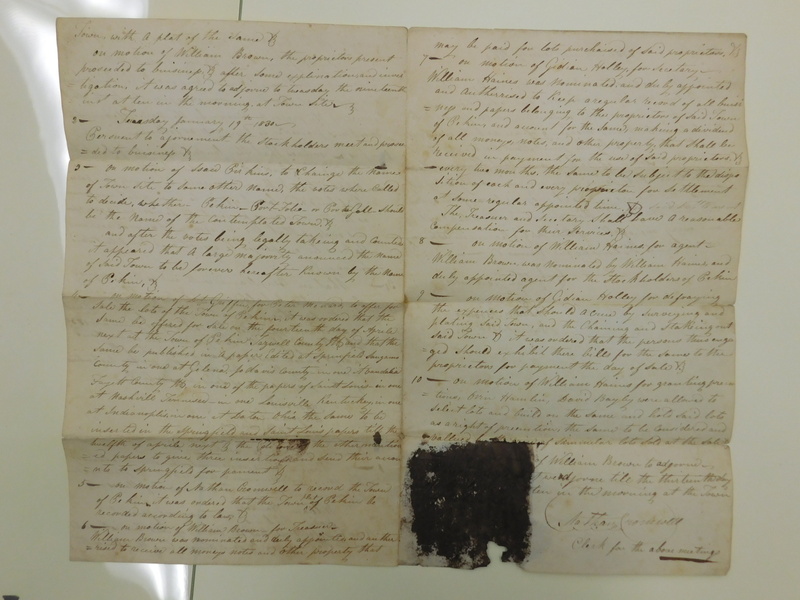 The 1860 diary of Pekin pioneer Jacob Tharp (1773-1871), shown here, is one of the most important primary sources for the history of Pekin’s founding. “. . . After a streak of bad luck, in 1825, [I] left Ohio, where I then resided, and traveled through Indiana with one ox-team, a span of horses, and a family of twelve persons, reaching the site of Pekin just before Christmas. “Jonathan Tharp, my son, built the first house ever erected in the city of Pekin, in 1824, on the spot now occupied by Joshua Wagenseller’s residence. Jonathan’s farm embraced the land now covered by our heaviest business houses. “At the time of my arrival, Jonathan was the only occupant. Their neighbors were Major Nathan Cromwell, living on the Hawley farm; Gideon Hawley, living on the Mackinaw side of Sand Prairie; Seth Wilson, living on John Young’s farm; John and Geo. Clines, between that place and Tremont; the Woodrows and John Summers, living in the Woodrow settlement; the Dillon family, after whom that township was named; the Hodgsons, friends and relatives of the Dillons; old Benj. Briggs, afterwards Sheriff; James Scott, who with Wilson, acted as constable in those days; and Wm. Eads, who was the first miller in this section of the State. He ran a ‘horse-mill,’ and ground only corn. On New Year’s day, 1827, I went to Fort Clark, now Peoria, where I found a few cabins occupied by John Hamlin, James Dixon, and others. Hamlin had a little store, and I bought groceries, coffee selling at 37 ½ cents per pound. On my way home I contracted for mast-fed pork at $2.50 per hundred. I soon built my cabin, placing it about half way between Joshua Wagenseller’s house and the present landing at the river. “In the summer of 1827, the first consignment of goods was sent to Pekin, by one [Mordecai] Mobley, the land auctioneer. I received them, and so won the honor of being the first commission merchant. Most of the goods, however, went on to Mackinaw, which was the first shire-town. Pekin at this early day, was reported to be the best commercial point on the Illinois river. All goods came up from St. Louis, which was the great basis of supplies for the settlers. “The Government surveys were made previous to 1828. This year we were cheered by a close neighbor, a Mr. Hinkle, who came to put up a trading house for Absalom Dillon. The goods came before the house was finished, and so my smoke-house was used for the first store. This season the Methodists established a mission, and their first service was held in Hawley’s house, on Sand Prairie. In the fall of 1828, Absalom and Joseph Dillon moved to Pekin, and ‘camped out’ for a while. Major Cromwell came in 1829, and bought out Dillon’s stock in trade, when those gentleman returned to the country. In the same year, Hawley and William Haines built cabins in our town. The inhabitants then consisted of Cromwell, Hawley, Haines, Dr. John Warner, the two Hiatts, Jonathan Tharp and myself. Mr. Clark made a raft of hewed puncheons, and started the ferry, placing a stake just below the present ferry landing to mark his claim. “In the spring of 1830, the proprietors surveyed and laid out the town, Perkins, Hawley, Haines and Cromwell being the active agents. Cromwell did the surveying. About this time Perkins sold out to Thomas Snell, from Cincinnati, Ohio. The gentlemen were much exercised about the way in which to lay off the celestial city. The elder Hiatt had a claim upon the Lake shore, but when the land sales occurred he forgot to bid, and Carpenter bought his tract, also buying eighty acres on the east side of said tract. The proprietors of the future city included these two tracts in the town-site. Mr. Hiatt was appeased with a pony purse of seventy-five or eighty dollars. On Jan. 19, 1830, according to the minutes, the company’s commissioners met again to decide on the name of the new town and to arrange the sale of lots to be announced in several newspapers throughout the Midwest. Isaac Perkins made the motion to vote on the town’s name, and three names were proposed: Pekin, Port Folio, and Portugal. According to old pioneer tradition, Nathan Cromwell’s wife Ann Eliza had proposed the name of “Pekin,” and that name garnered the most votes – and thus Pekin was born. Quite a lot has happened in Pekin in the 192 years since Jonathan Tharp built his log cabin at a spot that is today the foot of Broadway. Many of those events have been documented in books, newspapers, and photographs, but most have been forgotten – and even what has been recorded often suffers from gaps of detail that might be of interest to us today but didn’t seem important enough to our ancestors to record. Last month’s opening of the Tazewell County Courthouse 1914 time capsule, however, is enabling local historians to refresh many of our memories of the county’s and Pekin’s history. Among those refreshed memories are forgotten details of the story of Pekin’s founding which never made it into the history books. That and other fascinating details are found in a four-page document that was one of several items included in the 1914 time capsule but not listed among the contents of the courthouse cornerstone printed in the “Historical Souvenir” published for June 21, 1916 dedication ceremonies. Apparently it was decided to include this document and several other items only after the “Souvenir” was already printed. When the time capsule was opened last month, this document was found within a stationery envelope of Pekin attorney John T. Elliff. Typed on the envelope was this description of the document’s provenance: “The within paper left in the office of the late William Don Maus and now in possession of John T. Elliff, Atty., Pekin, Ill.” William Don Maus (1836-1901) — not to be confused with Pekin’s pioneer physician Dr. William S. Maus (1817-1872) — had come to Tazewell County with his father in 1847. William Don Maus moved to Pekin in 1854 and became an attorney in 1857, later serving as a county judge in the 1860s. The document in question dates from 1830 and contains handwritten minutes from the stockholder meetings of the company that founded Pekin. The minutes were taken at meetings held from Dec. 28, 1829, to Jan. 19, 1830, and then formally attested and signed in March 1830. The information in the minutes substantially corroborates the accounts of our city’s founding that may be read in the standard published works on Pekin’s history. Some of the specific traditions about Pekin’s founding are not substantiated by the minutes, while other quite interesting details mentioned in the minutes go unmentioned in the standard Pekin histories. To illustrate that point, let’s first review what Pekin’s pioneer historian William H. Bates (who seems to have selected most of the contents of the 1914 cornerstone time capsule) had to say about Pekin’s founding in his account which was printed in the 1870-71 Sellers & Bates Pekin City Directory, pages 9-10. “At the land sales at Springfield in the fall of 1828, the ‘Town Site’ was purchased by Maj. Cromwell for a company composed of himself, William Haines, William Brown, Thomas Snell, Peter Menard, Dr. Warner, A. Herndon and —- Carpenter, of Sangamon county, and the purchase was divided into twelve parts. The question as to who should possess so important a piece of ground as the present location of Pekin created considerable excitement and the feeling rose to such a pitch at the land sale that pistols were drawn and bloodshed seem (sic) inevitable. The parties above mentioned, were successful, however, and the matter was amicably adjusted. . . .
“In 1829 a survey of ‘Town Site’ was made by William Hodge of Blooming Grove, then County Surveyor. The compass run without variation and, in the absence of a surveyor’s chain, the town lots were measured with a string. Many of the details in Bates’ account are supported by the testimony of the minutes, but many other things of which Bates tells aren’t mentioned in the minutes at all. For example, the names of company members Cromwell, Haines, Brown, Menard, and Carpenter appear in the minutes (which give Carpenter’s first name as William), but Bates’ account doesn’t mention other settlers who have long been known to have been important members of the company, such as Major Isaac Perkins and Gideon Hawley (called “Isaac Pirkins” and “Gidian Holley” in the minutes). As for the skirmish at the land sale, related in Jacob Tharp’s 1860 diary as well as the 1949 Pekin Centenary and 1974 Pekin Sesquicentennial volumes, perhaps understandably no reference to it appears in the company minutes, nor is there any mention of the purchase being divided into 12 parts. The minutes merely state that the land be surveyed and laid out into lots, and that Major Nathan Cromwell was appointed “to survey said parcels of land, and lay it off into Town plat and forme (sic) as the Commisioners (sic) present did devise and agree upon.” The minutes record the surveying of “Town Site,” calling for the hiring of “Chain carriers and Stakers” to “afsist and Compleet said Survey,” but the name of the actual surveyor, William Hodge, isn’t mentioned, nor is anything said in the minutes of the unavailability of a surveyor’s chain making necessary the use of string. The minutes are especially valuable for providing specific dates for key events in the process of Pekin’s founding. Later sources generally give only the year or the season of the year in which these events took place, and sometimes these sources even give the wrong year. The minutes make clear, however, that it was on Dec. 28, 1829, that Cromwell was appointed to survey and stake out the proposed town, and Cromwell reported on Jan. 18, 1830, that “the survey of Said Town, is Compleeted (sic) and the Stakeing (sic) nearly done.” On Jan. 19, 1830, the company’s commissioners met again to decide on the name of the new town and to arrange the sale of lots to be announced in several newspapers throughout the Midwest. That same day, the commissioners directed Cromwell to have the town plat “recorded according to law,” and then chose two of its members as officers of the corporation. Brown was named treasurer as well as the land agent for the stockholders, and Haines was named secretary. The minutes say nothing about Ann Eliza Cromwell choosing the name “Pekin,” but given the unanimity of the early sources that “Pekin” was her idea, there is no reason to doubt that tradition. The early sources and standard histories say nothing, however, about “Pekin” being just one of three possible choices – and consequently we don’t know who wished the new town to be named “Port-Folio” or “PortuGall” (Portugal). How very different Pekin’s history would have been had “Port Folio” or “Portugal” beat out “Pekin.” There would never have been a Pekin professional baseball team named “the Celestials,” no Chinese-themed downtown theater, and instead of the “Pekin Chinks” and “Pekin Dragons,” we might instead be rooting for the Port Folio Financials or the Portugal Galos (Roosters). 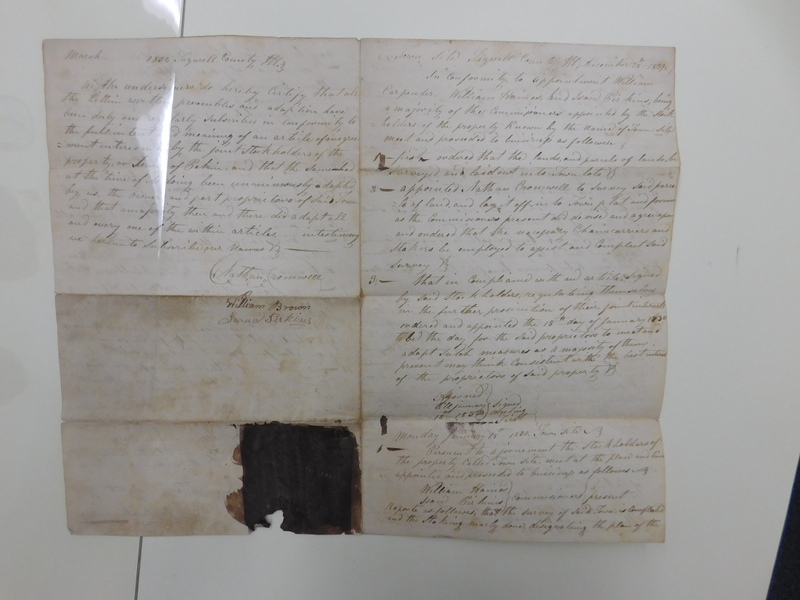 Full images of the 1830 minutes document, along with a complete transcription of the document’s cursive script, may be examined below. The Tazewell County Genealogical & Historical Society will also feature the document and a transcription in its monthly newsletter. Meet and proceeded to buisinefs as followes. surveyed and laid out into Town lots. of the proprietors of said property. Town, with a plat of the same. inst at ten in the morning. at Town Site. be the name of the contemplated Town. -nts to Springfield for pament. may be paid for lots purchaised of Said proprietors. received in payment for the use of said proprietors. at Some regular appointed time. Proprietors for payment the day of Sale. valued by the price of Simmilar lots sold at the Sale. March      1830, Tazwell County, Ill.